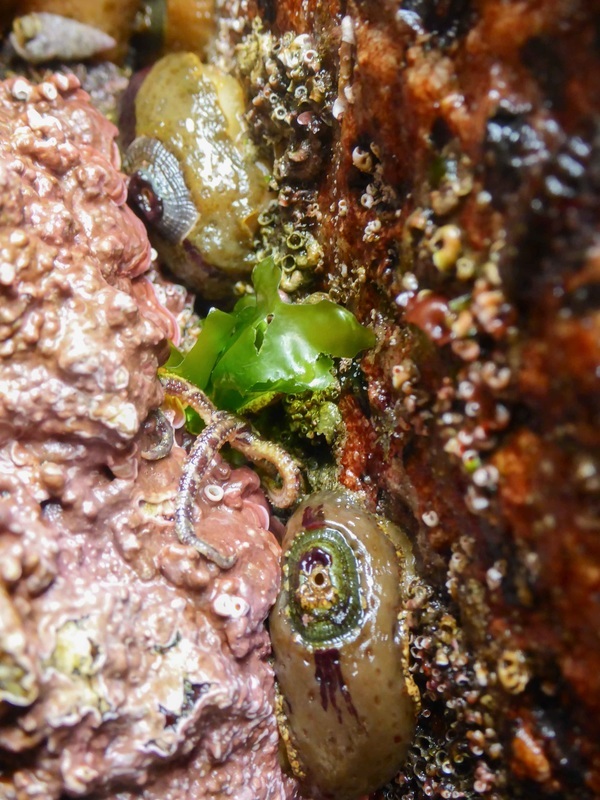 Two-spot keyhole limpets nestled in crevices in the extreme low intertidal. Photos by Sara Wickham. At first glance the two-spot keyhole limpet may look like a cross between a nudibranch and a strange chiton, or a nudibranch and a limpet. This is because its soft body is much larger than its shell, and often the mantle extends further over the edge of the shell to cover it almost entirely. The mantle may also extend over the edge of the large hole in the middle of the shell. When the animal is in motion, with its foot visible and its tentacles extended, it looks even more like a nudibranch. The shell, which gets to 2 cm long, is an elongated oval shape and is crosshatched with radiating and circular ridges. The hole in the middle is also elongated, and is about a third of the shell's length. The soft body varies in colour — it can be red, orange, yellow, brown, or white — and has dark spots or patches. The two-spot keyhole limpet inhabits rocky areas in the intertidal and shallow subtidal to 33 m deep. It can be found on or nestled among compound tunicates, sponges, and kelp holdfasts. Its range extends from southern Alaska to Baja California, Mexico. The shells of the two-spot keyhole limpet and the rough keyhole limpet (Diodora aspera) could be confused, but not the animals themselves; the rough-keyhole limpet's body is only slightly bigger than its shell, though its mantle can extend to cover much of the shell when the animal is in defensive mode. The hole in its shell is much smaller as well; only about 1/10 the length of the shell, and more round. 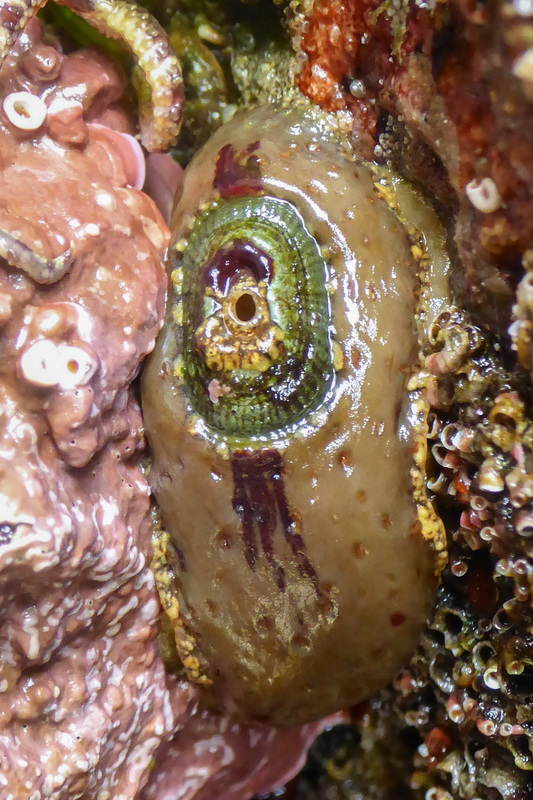 The two-spot keyhole limpet appears to feed on the sponges and compound tunicates among which it can be found. Cowles, D. (2007). Fissurellidea bimaculata (Dall, 1851). Invertebrates of the Salish Sea. Rosario Beach Marine Laboratory. Accessed 23/06/2016. Harbo, R. M. (1997). Shells & Shellfish of the Pacific Northwest. Madeira Park, BC: Harbour Publishing. P.186.